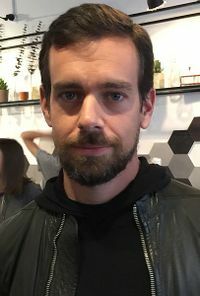 Jack Dorsey is the founder and CEO of Twitter, and the founder, CEO, and chairman of the payment system Square. Dorsey told attendees at the Consensus blockchain conference in May 2018 that he believes the Internet will one day have a native currency. He said he is not certain which currency it will be, but hopes it turns out to be bitcoin. He repeated this sentiment in an interview on the podcast, "The Joe Rogan Experience" in February 2019. Dorsey has also said that he is interested in integrating bitcoin as a payment option for Square. In March 2018, Dorsey, along with several investors including Litecoin creator Charlie Lee, donated a total of $2.5 million to Lightning Labs in order to develop the Lightning Network, a scaling solution for bitcoin. In February 2019, Dorsey responded to Twitter user @ThomsonCrypto's question, "which coins/tokons you holding??" Dorsey replied, "I only have bitcoin." When asked how many coins he possessed, he said, "enough." He has also said that he is a fan of bitcoin because it is "resilient, principled, native to Internet ideals, and because it's a great brand." In March 2019, Dorsey said on the podcast Tales from the Crypt that he had been buying so much bitcoin on Square's Cash App that he had been maxing out the app's weekly limits of $10,000. In March 2019, Dorsey announced that Square was in the process of hiring up to five developers for a group to develop "open source contributions to bitcoin and [the] crypto ecosystem." These positions are all full-time, and the project will be based in Square's San Francisco offices. Reportedly, this team will have the option to be paid in bitcoin. ↑ Jack Dorsey Is All In on Bitcoin as the Currency of the Future. Bloomberg. ↑ Twitter CEO Jack Dorsey Hopes Bitcoin Will Become the Internet's Own Currency. Fortune. ↑ Twitter CEO Jack Dorsey Has Made A Bold Prediction About Bitcoin. Forbes. ↑ Jack Dorsey Hopes Bitcoin Will Become Web's 'Native Currency'. Coindesk. ↑ Lightning Labs just raised millions from Jack Dorsey and others to supercharge blockchain transactions. TechCrunch. ↑ Jack Dorsey is among backers of blockchain start-up Lightning Labs. CNBC. ↑ Twitter's Jack Dorsey Says the Only Crypto He's Holding Is Bitcoin. Bloomberg. ↑ Tech billionaire Jack Dorsey just bought $10,000 worth of Bitcoin. Decrypt. ↑ Twitter CEO Jack Dorsey Launches Open-Source Bitcoin Dev Team. Finance Magnates.